Haileigh has definitely been enjoying her voice lessons and there's no question that she looks forward to seeing Martha each week. Martha is both energetic & fun while providing instruction, and my husband & I definitely appreciate her efforts! Anita was a pleasure to deal with, prompt and very courteous and welcoming. This choice was also local. -Linda"
Lucas is loving his lessons with Ben, and I find Ben to be very pleasant, professional, helpful etc. overall we are very pleased with Music Elements! " "My oldest daughter has been with Music Elements for a year and a half and she loves it! She takes voice lessons; only after a few lessons her voice quality and range improved quite noticeably. Since then my daughter has had many performances, solos and leads in shows. Anita, the owner, is so welcoming and accommodates us with lessons to work around our busy schedules if needed. She answers her e-mails right away and is always pleasant! My second oldest started taking piano and is thriving with progress every week. The waiting room offers crayons for my younger ones - and coffee/water for adults (which is so nice after a long day). The staff is friendly and the students leave happy! I'm so glad that Anita found me on here and we are thankful to work with such a talented, successful school right here in our home town! " "John was great, he is already tailoring the lessons nicely to my desires as an experienced musician learning a new instrument, and I'm looking forward to continuing." Chuck G.
Anita is awesome along with her music staff. They are exceptional musicians, all kind, patient and very knowledgeable in their field of music expertise. I would not hesitate to recommend them for lessons in the music field of your choice. My daughter is taking drum lessons with Dylan, who is in a band and working on his masters in music, so these teachers are very experienced people. She enjoys his lessons and learns a lot each and every time. She comes out with a smile after each lesson because she gets better and better each time. - Peg N.
Anita and the teachers are amazing! They really try to teach you in way that you would understand. My kids took guitar lessons there with no former guitar knowledge whatsoever. They make you feel so comfortable, I started taking voice lessons myself. Keep in mind that I am 30 years old and completely tone deaf. I love Anita and her teachers and hope to continue to grown with them. -Rathana C.
Anita and the Music Elements staff are very personable and make you feel like part of their "music family". My daughter takes vocal lessons there and she enjoys going, which is great!! 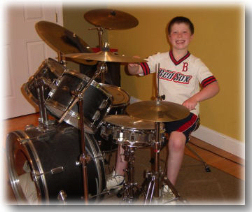 -Kristina R.
We were looking for some advanced lessons for my son who has been learning Drums for a few years. Anita was very personable and returned my calls promptly to explain the school, class structure, fee etc. I was most looking for flexible time schedule, and she was able to find the time that best worked for us! Most importantly, instructor is great and my son has started to get back in the rhythm of practice and getting challenged enough to keep his interest on. So far great! Overall, our experience is great with Music Elements! -Raj V.
I have three children taking lessons at Music Elements. It has been a great experience for all them. Anita's warm and friendly way adds to the overall experience. As a busy mother I appreciate when someone goes out of their to make the schedule as easy and manageable as possible. I would absolutely recommend Music Elements! -Jean K.
My son is taking both vocal and guitar lessons. He is loving his sessions and learning a lot. He looks forward to his lessons every week (really). When evaluating Music Elements, Anita took the time to meet with me and view the teaching rooms so that I would feel comfortable. She also took the time to listen to what we were looking for for our son and paired us with an instructor that was a great fit. I highly recommend Music Elements! -Tina D.
My voice teacher is extremely knowledgeable and fun as well :). A wonderful musical experience. -Avey W.
Although my journey is just beginning and there is still much to learn Ive noticed already that I've applied new singing techniques and my confidence level is increasing. Alicia H.
I do have to say, we could not be happier with both Dylan [Dylan Jack] both my boys absolutely love them and so enjoy their lessons!!!! They both go the extra mile all the time. Melissa D.
Anita is a caring and very talented person that offers so much for any student that wants to learn an instrument ~Jamie L.
My daughter had only one lesson so far but she but she absolutely loves her teacher. The owner [Anita Connerty] is very nice and took the time to talk with us and explain things. Looking forward to continuing lessons with Music Elements!~Peg C.
Morgan LOVED her voice lesson and is so excited about it. Thanks so much. I knew her shyness would go away, but it's still a huge step for her to sing alone in front of someone. You were great with her and she really enjoyed it! I am thrilled that she was so happy and we both look forward to more lessons. I just want to give all 3 of you a big THANK YOU! Nicki you did a great job especially crowd control! It was a successful fundraiser and we made over $50,000! I can’t believe it! There was over 350 people and everyone was extremely generous with their money especially in today’s economy. It is so wonderful when people come together to help others. Again, thank you all so much. It was truly appreciated. Hi Anita, Thank you again for all of your hard work. Our grad orientation was a huge success (again!!!) Mark pulled off the entire event flawlessly --- he had the party jumping from beginning to end. We absolutely love working with him and will keep him in mind for any event for which we need a DJ. Send an email to web designer Rachel Negris with questions or comments about this web site.